Announcement forms are now available online! Print out yours, fill it out, and bring it or send it in to Lincoln Daily News. We welcome your pictures, black and white as well as color. This free service is extended to all of our readers. Your announcement will be posted online. Anyone, anywhere can read it! Now Aunt Betty in Florida, Uncle Bob in Alaska, and Cousin Frank in Fiji can log in and read your announcement on Lincoln Daily News! 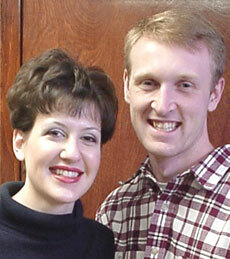 Katherine Heller and Tim Lueking, both of Lincoln, are engaged and plan to be married later this year. Katherine is employed at Lincoln Christian College and Seminary as director of marketing and public relations and as a library assistant. She earned a bachelor’s degree in professional writing and editing from Youngstown State University. Tim is the minister at Lake Fork Christian Church and adjunct mathematics instructor at Lincoln Christian College. He is also currently a seminary student, pursuing his Master of Divinity at LCCS. His bachelor’s degree, in mechanical engineering, is from Rose-Hulman Institute of Technology. Katherine’s parents are George and Vickie Heller of East Palestine, Ohio. Tim’s parents are Dr. Allen Lueking and Donna Lueking of Sullivan, Ind. The wedding is set for July 28 at First Christian Church, Columbiana, Ohio.